So I last updated the Phuket weather blog on April 21st, which was when I started a little holiday. we'd just had Songkran and the weather was HOT. Every day. Really hot. A few little showers, but I say again, it was HOT. I was away from Phuket from April 23rd - May 9th (except my wife and I came back from Chumphon on April 30th, and went back again on May 2nd). While we were away, people told me the weather in Phuket was ... HOT! And we drove up and down the east coast of Thailand from Nakorn Si Thammarat to Chumphon to Prachuap Khiri Khan and it was hot there too! We did not see much rain at all. Let's start with the weather NOW. It's May 13th, a calm and quite warm evening. Today was mostly sunny where I was at Karon Beach, though some dark clouds appeared late in the afternoon and it must have rained in some places, just not at Karon! 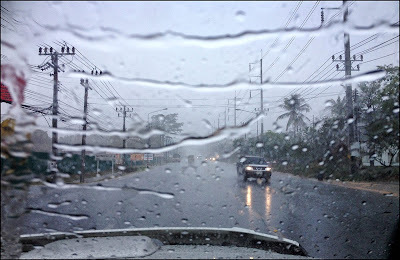 Rain is often very localised, so if you see rain, don't hide in your hotel, just drive! Or wait an hour and it will most likely stop. When rain comes it's not normally "all day rain" although this can happen sometimes too, and sometimes in low season you get a few cr*ppy wet days in a row. It's all but impossible to predict the exact weather. If you are coming to Phuket or the surrounding area between now and October, be ready with umbrella and factor 30. And research some things to do on a wet day! (above) at The Beach Bar, Cape Panwa on 11th May. Our holiday over on the east coast of Thailand was relaxing. We tend to be a bit lazy on holiday. A bit of beach, a bit of sleep, a bit of exploring. Now we're back in Phuket, kids go back to school tomorrow and I am back at Sunrise Divers, but we should have some time in low season for weekend trips. 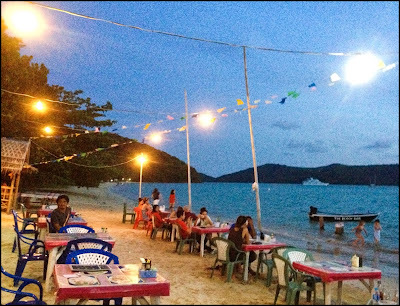 I have not written much on The Phuket Blog in the last few months, but have a list of things to see and to get blogged! So hope for plenty of good weather over the next few months. On the other hand, there has been very little rain this year and the island needs rain to fill up reservoirs.